Cleveland Clinic Florida has created the Bariatric and Metabolic Institute, an all-inclusive surgical weight loss program that combines clinical skills and patient support, providing comprehensive treatment. With an obesity rate approaching 80% of the population in The Bahamas and obesity’s intrinsic connection to diabetes, it is little surprise that Diabetes Type 2 is at an all-time high in the country or that the International Diabetes Federation has declared that is “taking a particular interest in The Bahamas.” While the 230-member country federation’s focus is attention The Bahamas could do without, the good news for sufferers is that new research is pointing to better outcomes with a multi-disciplinary approach. The research comes from a study by the Cleveland Clinic Florida, home of the Bariatric and Metabolic Institute, a surgical weight loss program that combines clinical skills with patient support at its Weston, Florida facility. The study found that the combination of bariatric surgery and medication is more effective than either treatment singularly. This could be important news for the approximately 36,000 people in The Bahamas who are diabetic. Another 23,000 are considered pre-diabetic, this in a country which the Minister of Health Dr. Duane Sands suffers from 79.2% obesity. One of the difficulties in managing diabetes is diagnosing early enough. Doctors say it is very important to recognize the warning signs to follow an effective treatment. Some of the most common symptoms are urination, frequent thirst, increased appetite, fatigue, recurrent infections, tingling in the extremities, blurred vision and slow wounds to heal. Once the diagnosis is complete, doctors work with patients to manage lifestyle, including diet and exercise routines. According to Dr. Raul Rosenthal, bariatric surgeon and director of the Bariatric and Metabolic Institute of Cleveland Clinic Florida, approximately half of type 2 diabetics are obese and the best option to manage this disease is with a multidisciplinary treatment. This includes the help of endocrinologists, diabetes nurses, nutritionists, as well as specialists from other branches. "The first step in the treatment consists of modifications in lifestyle, diet and exercise, and substantial. When the weight loss is not achieved by these efforts then the medication is started. The first line of treatment is oral medications, insulin therapy is usually added later, unless the patient has many symptoms and blood glucose levels are poorly controlled with oral medication,” said the Cleveland Clinic Florida bariatric surgeon. Dr. Rosenthal also commented on a recent Cleveland Clinic study which showed that the combination of bariatric surgery (surgical procedures to treat obesity) and medication are more effective in improving blood sugar levels in diabetic patients, than only with medicines. In that sense, Cleveland Clinic Florida has created the Bariatric and Metabolic Institute, an all-inclusive surgical weight loss program that combines clinical skills and patient support, providing comprehensive treatment. 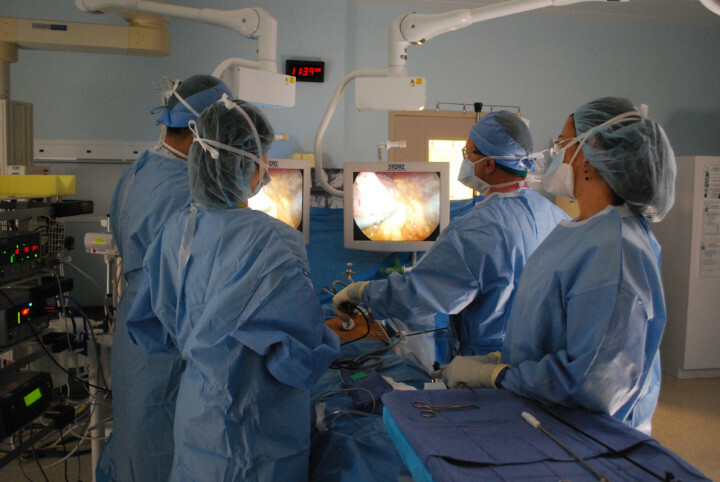 "Our surgeons are highly trained in minimally invasive bariatric and metabolic surgery, using small incision techniques whenever possible. This reduces the risk of complications and generally results in a faster recovery, with less pain and discomfort than a traditional surgery, "concluded the specialist.